Jobbik submitted three legislative proposals last night it hopes will stem the flow of asylum seekers into Hungary. While there is little chance any of the proposals will actually be adopted, the extreme-right opposition party has beaten Fidesz and the government to the punch in terms of offering any legislative solution to protection before parliament’s extraordinary session next week. The first bill would modify Hungary’s Fundamental Law, the country’s constitution, for the sixth time since coming into force in 2012. The bill would empower the government to order the Hungarian military to pre-empt and counter any pending “humanitarian catastrophe”. So what is Jobbik proposing? Allow the government to declare the situation a “humanitarian catastrophe”, then permit the government to use the humanitarian catastrophe as a reason to declare a state of emergency, and, finally, authorize the military to protect Hungary’s border and shoot at anyone crossing it unlawfully (a full constitutional amendment requiring a two-thirds supermajority). Jobbik thinks the government should be able to associate this so-called “humanitarian catastrophe” with a state of emergency. The proposal would essentially allow for the Hungarian military to secure the country’s borders in case an emergency arises. According to the Fundamental Law, the Hungarian government can only declare a state of emergency if there is some kind of calamitous incident involving the endangerment of life or property or an industrial accident. 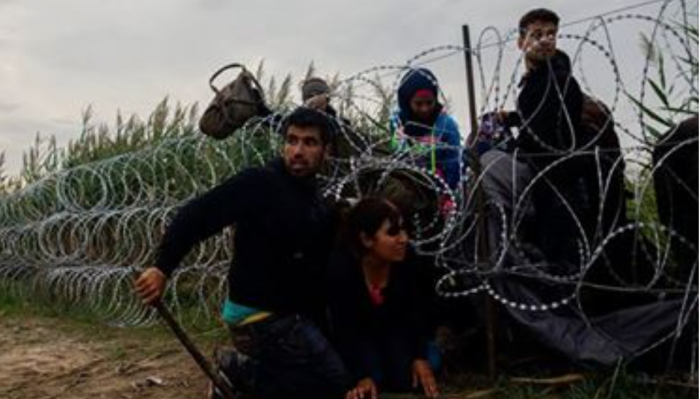 By connecting the arrival of asylum seekers into Hungary to a “humanitarian catastrophe”, and connecting the so-called humanitarian situation to a state of emergency, Jobbik proposes to authorize the government to use the military force to protect the borders. The party thinks the solution rests in a constitutional amendment that would allow the government to authorize the Hungarian military to protect the border. According to Hungarian law, the military is permitted and obligated to use firearms to protect any protected area that is in danger of being violated. Jobbik’s proposal would effectively allow the government to declare a state of emergency (using the “humanitarian catastrophe” argument) and designate the border as a protected area that needs to be guarded by the military, thereby authorizing the military to shoot at anyone who tries to cross the border unlawfully, writes Hungarian news site Nol.hu. Jobbik also submitted a separate proposal to change the law governing rights for asylum seekers. According to the proposal, the government would not have to recognize any foreigner as a refugee whose presence in Hungary poses a “serious threat” to the country’s national security or public order, or anyone who violated the public order and Hungarian laws by entering Hungary’s borders unlawfully and was deported. Jobbik submitted yet another proposal to make unlawful border crossing a felony. In this case, someone who simply crosses the border illegally would get one year in prison. Those crossing the border illegally in groups would get three years in prison, and those who damage a border fence or cross the border illegally with weapons would get five years in prison. Will Jobbik be outdone by Fidesz? Probably. Minister Overseeing the Office of the Prime Minister János Lázár told reporters yesterday that the government is exploring legislative options that would not require a two-thirds supermajority vote in parliament. Hungarian news site Nol.hu reports that Hungary’s Fundamental Law does not address expressis verbis what the Hungarian military can do in times of peace. Therefore, a simple modification to the Law on National Defense would be enough to involve the military in protecting Hungary’s borders against waves of refugees.